“Affidavit photo of Yee Ton Lock,” 1898, Chinese Exclusion Act case files, RG 85, National Archives-Seattle, Yee Ton Lock case file, Seattle RS Box 78, file# RS 14450. 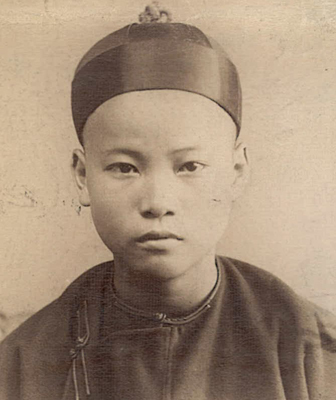 In August 1898 Yee Hang applied to U.S. Immigration to have his thirteen-year old son, Yee Ton Lock (Look), join him in McKeesport, Pennsylvania. Yee Ton Lock arrived in Port Townsend, Washington on 16 August. His uncle Yee Mow, a business owner on Water Street, filed his petition. Several people in McKeesport wrote letters of recommendation saying they were personally acquainted with Yee Hang and he was a good citizen. The Collector of Customs in Port Townsend received letters from Joseph A. Skelley, alderman and ex-officio Justice of the Peace; Homer C. Stewart, cashier of the First National Bank; Joseph R. Sean, Chief of Police; and Fred Steckel, business owner. In an affidavit Yee Hang declared that he was a native of China and had been a resident of McKeesport for twenty-five years. He wanted to bring his son to the U.S. so he could receive an education in English and business. S. J. Hutchison, ticket agent, B & O Railroad; J. E. Inghram, chief rate clerk; Mrs. Mary E. Inghram, S. S. teacher; R. T. Carothers, mayor, McKeesport; Homer C. Stewart, cashier, First National Bank; Charles A. Tawney, teller, First National Bank; Joseph A. J. Kelley, Justice of Peace; V. F. Geyer, retail merchant; Ada Page, Sabbath School teacher; Eugene Rodgers, grocer; S. B. Page, grocer; R. W. Ekin, secretary, Water Dept; Edwin Sales, superintendent, Water Dept; Henry A. Clante; F. B. Satterthwait, watchmaker; Adolph Schmidt, druggist; Charles William Kahl, drug clerk; J. W. Campbell, insurance agent; W. L. Laughlin, National Hotel; B. B. Cousin, real estate dealer; Edward Huber, clothier; F. W. Steckey, merchant; George W. Hartman, hardware ; William B. Fell, assistant postmaster; Erwin Meyer, postmaster; F. L. White, physician; James E. White, druggist; I. Wallis, accountant; Harry T. Watson, accountant; J. B. Shale, Surveyors Office; John N. Orth, florist; E. R. Donahue, pastor, West End Presbyterian Church; and Charles Tory, deputy surveyor. 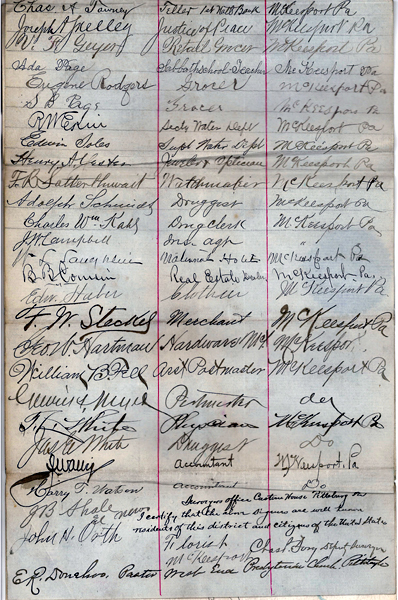 “Petition for Yee Hang,” 1898, Chinese Exclusion Act case files, RG 85, National Archives-Seattle, Yee Ton Lock case file, Seattle RS Box 78, file# RS 14450. 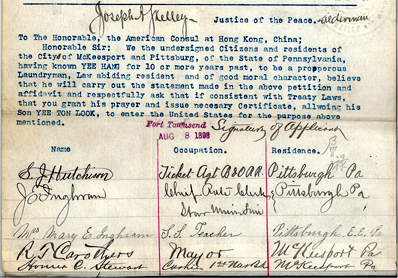 The cover sheet of Yee Ton Lock’s file says, “His father keeps a laundry in McKeesport and claims to have been born in U.S. No proof produced. Refused in the absence necessary proof. There is no further information in the file to tell exactly when Yee Ton Lock was deported.